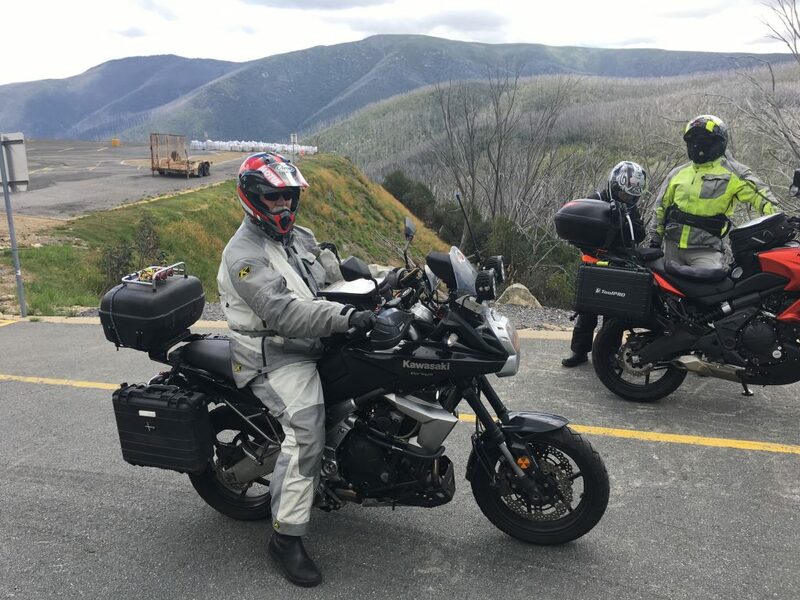 There was a FarRide planned for Mt Beauty, Victoria that a bunch of my friends were going to including Bill and Ox who had planned an SS1600K that included riding some twisties on the way home in the Victorian Alps. 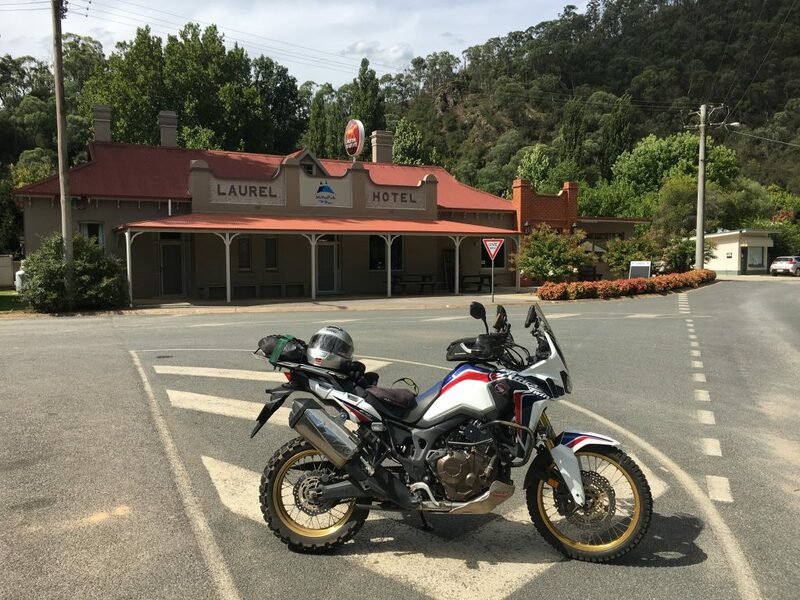 I recently had a McCruise fitted to the Africa Twin by Dale McLean and decided it’s be fun to tag along for the ride to test it out. So I slapped the Airhawk on it, RAM mounted the SPOT and Etrex to the handlebars and it was ready to go. We met at the Shell at Wallsend at 3am. Ox and his nephew, Nevertire Nic, were there when I arrived. Bill arrived shortly after. On reflection an odd group for an IBA ride. 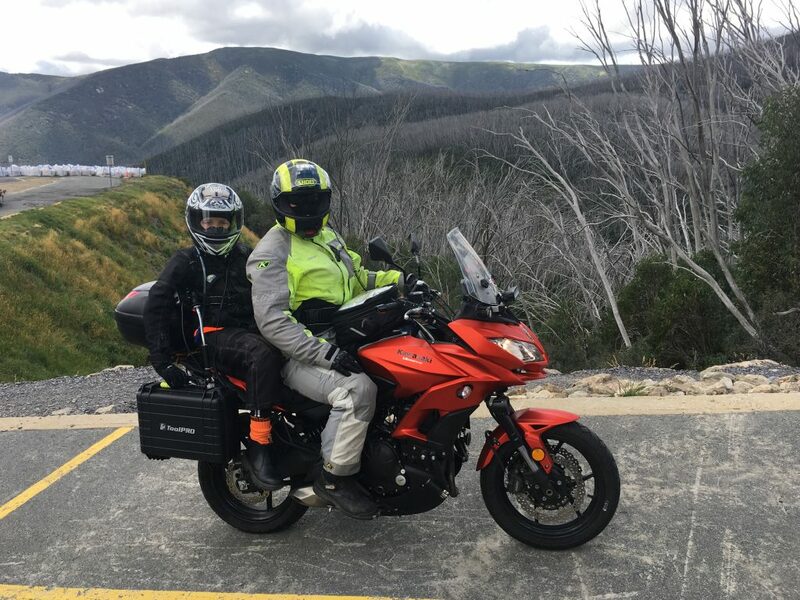 Two Versys 650’s, one with a pillion and an Africa Twin with knobbies. I guess when you’ve done a few of these long rides you don’t really think too much about what bike you are on. Bill and his Versys have done a bunch of big days. It doesn’t really matter that much what you ride as long as you are comfortable (enough). With dockets and documentation done we were off. 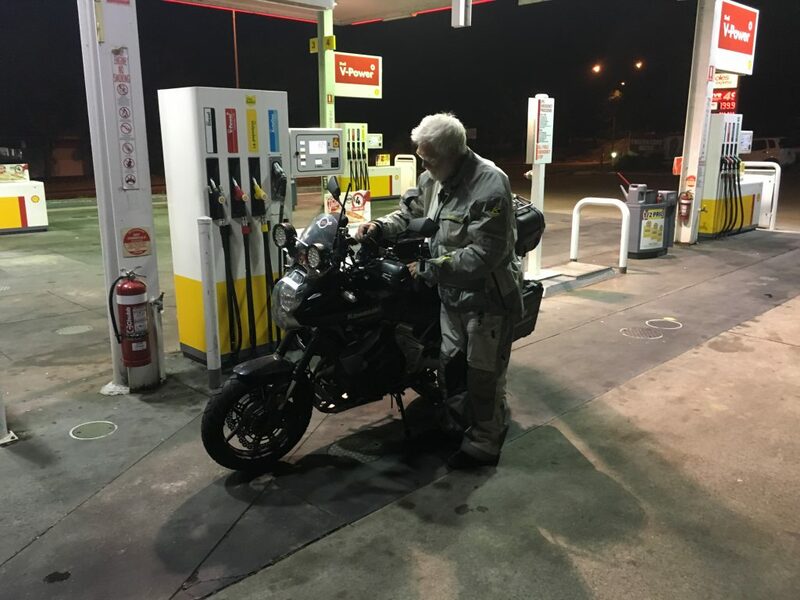 It was supposed to be an easy transport leg for a quick stop at Pheasant’s Nest but a collision around Mittagong on the Hume saw us being diverted off the freeway. We were soon back on it only to be turned around by the roadblock and being told to take the back way. I had no idea where that was but I was following Ox and he seemed to know. 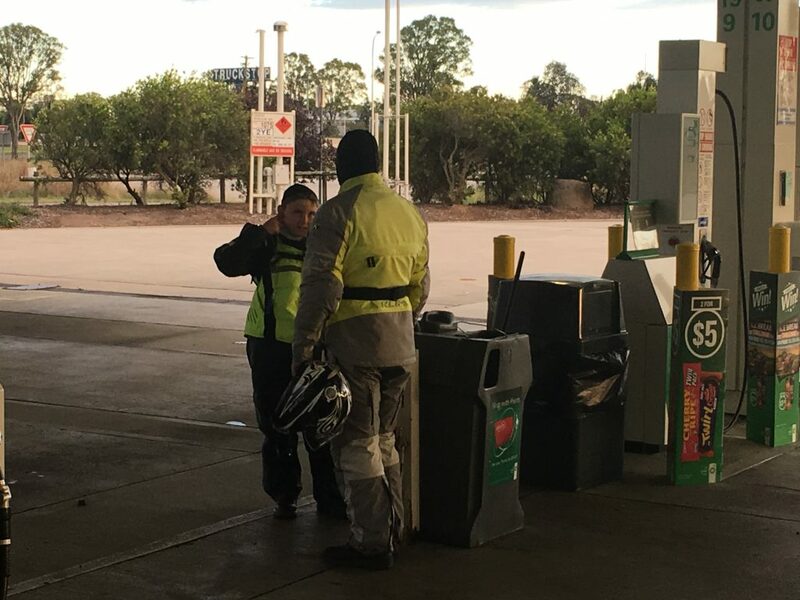 Bill dropped off the back during that part of the ride but caught up with us at our first stop at the BP at Marulan. The diversion had left me a tad worried about fuel and the gauge told me I had less than 1 litre left, it took 18.5. So I averaged 5.6l per 100ks and the range was 350 by the ODO. Here’s Ox and Nic at Marulan. We’d also lost much of the time buffer Bill built into the plan. 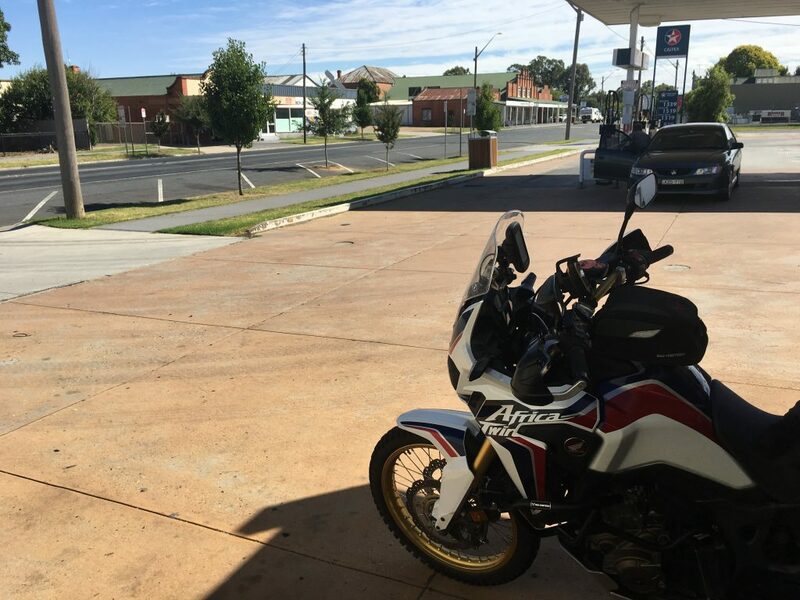 The next stop was Holbrook (~ 650kms). It’s worth noting that the BP Ultimate at Marulan caused the fuel consumption to jump straight up to 5.9-6 l/100km, none of the other fuel in similar conditions went anywhere near that cruising at 110kph. It was starting to warm up a bit, we’d gone though some very light showers here and there since the start of the ride but the sky was clearing. As happens when you start getting within a couple of hundred k’s of a FarRide destination we also started to see others heading there. Holbrook is a bit quieter though since the freeway bypass opened. We arrived at Mt Beauty (~ 810kms) a touch after 12pm and the usual g’days and catchups started at speed dating pace. It’s always nice to catch up with other riders (Nico, Angel, Frans, Vlad, Lynne, Fatman, Hackle and other legends). There’s never enough time time to see everyone. When Ox and Bill were finished with the FarRider stuff we fuelled up and headed for the hills. I stopped for a while at Falls Creek and admired the view. Then we crossed the dam and took on the Bogong High Plains Road, beautiful scenery and no snow this time. I’ve ridden this road once before in the opposite direction, but not on a TKC80 and a Motoz Tractionator Adventure (rear). I’ve not really done knee down stuff on the Africa Twin before. The 21″ front makes it interesting and it’s lighter than most of my bikes. It took a little getting used the throttle and weighting but soon enough I was on a pace I was happy with and I found the sweet spot in the gears. I stopped for a breather at the intersection with the Omeo Highway. We were heading towards Mitta Mitta and I was excited because I haven’t ridden that section of the Omeo before. Wow, it was awesome. Corner after corner after corner. The traffic was light, the road surface was great and I got well used to the knobbies squirming and the footpegs “adjusting” to the lean angle. At Mitta Mitta we stopped for a drink and a docket to prove the route. What a lovely spot. It had taken some hours to get there from Mt Beauty, the original plan had us taking some more twistes to the north re-entering the Hume at Adelong however after some discussion it was decided to head to Wodonga Vic and take an easy 700k slab ride home to make sure we were on it and away from the roos before dark. We were separated from Bill in that section and sent him an SMS that we’d catch him in Holbrook. He arrived at Holbrook soon after us and we took some time there to prepare for the impending darkness and drop in temperature. Nic had a little lay down on the concrete with a jacket over his head. Tough little guy that one, it’s not his first IBA pillion experience. Our next planned stop was Goulburn. 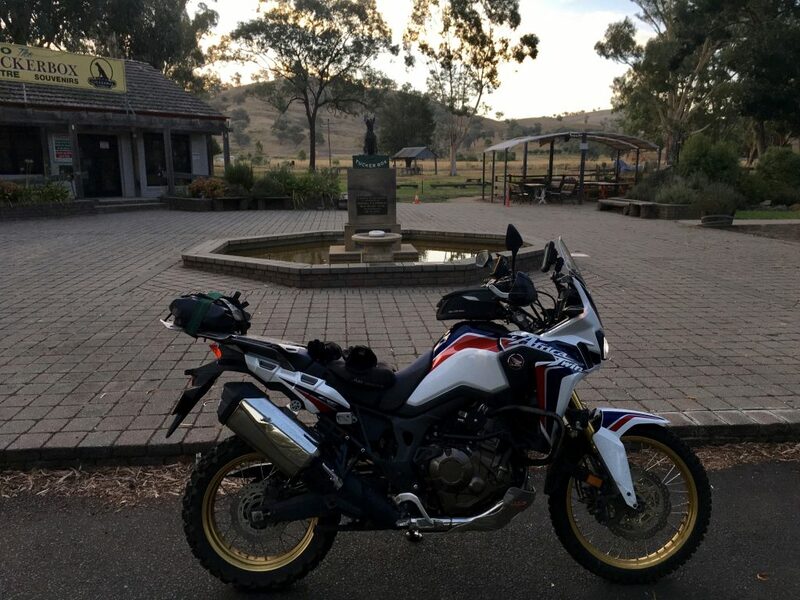 I dropped off the back to take a pic of the Africa Twin at the Dog on the Tuckerbox about 9 miles from Gundagai. I was feeling pretty good, a chunk over 1200k’s done and only about 500 to go. We fuelled up at the Big Merino and had some food at the Macas nearby, the last required stop for the ride. I left there in front and cruised through the Southern Highlands. There were plenty of signs of rain, storms and lightning but thankfully while we were passing though the severe thunderstorms and massive hail that trashed that area that evening were not above us. Bill, Ox and Nic dropped off the back during that part of the ride, that was the last I saw of them. I stopped at Thornleigh for a flat white and also to get a docket. 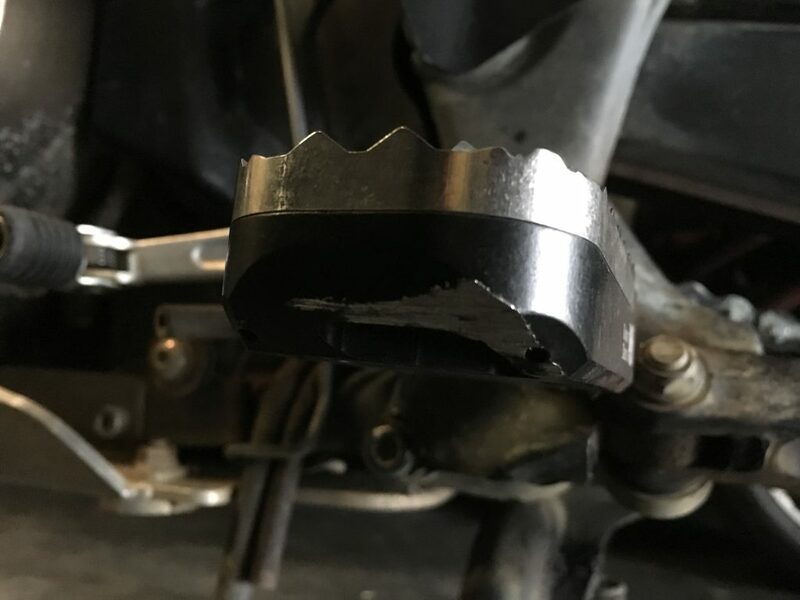 The Etrex reported I’d ridden 1640+kms so I decided to seal the deal and get sufficient documentation for the SS1600k in case the wheels fell off in the last leg. Insurance out of habit. I needed a bit of a stretch too. Then back on the very, very familiar M1 I kicked back and thought of home. A capella renditions of everything from Minnie Ripperton to Slipknot in the private world of the helmet. I think it’s about time I got some music on the AT. I arrived back at the 7-Eleven at Lambton about 2.30am. I grabbed the obligatory celebration Cherry Ripe, a receipt, took a snap of the etrex and headed home to complete the IBA documentation. Here’s the day’s stats. 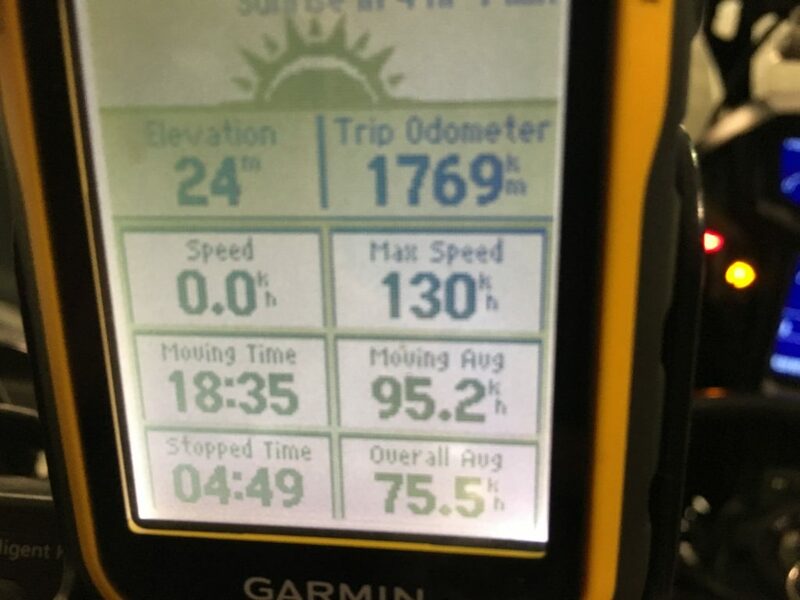 The ride took almost 23.5 hours due to the unusual amount of stopped time and social fun. The Africa Twin proved itself a great option for an IBA ride, particularly with the cruise control fitted. The McCruise unit worked flawlessly. It’s the first one I’ve had with the new electronic servo after two with the vacuum. A nice improvement on a great product. The Knight Designs footpegs are starting to bed in nicely too. 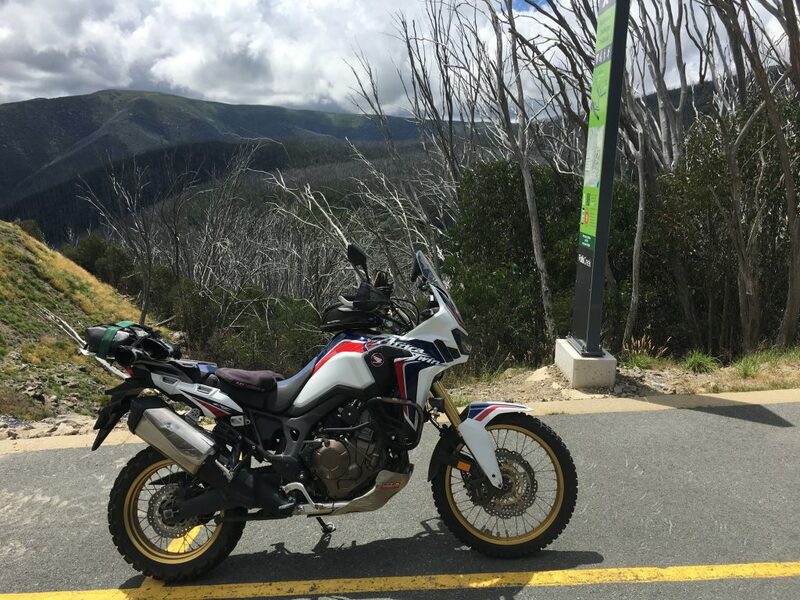 So there it is, the Africa Twin’s first IBA ride. It’s certainly proven it’s a capable and comfortable long distance bike. 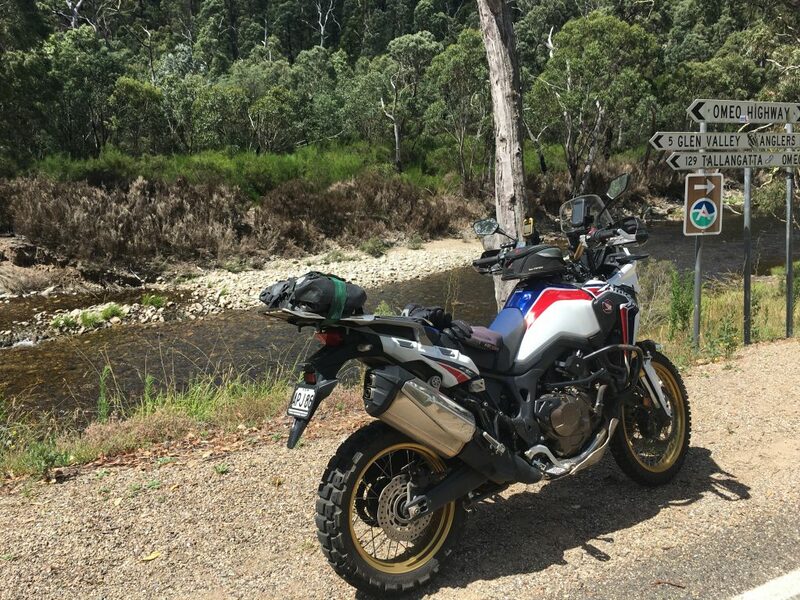 So if you are an adventure rider looking to get out to the fun of the Flinders Ranges or the Tanami or just want to knock off the 1000+k a day transport legs to off-road fun with ease but still have significant off-road capability when you get there the Africa Twin certainly fits the bill. Also good to see yourself at Mount Beauty Craig, if only for a short while. I’m sure the “bumble bee” will service your every need. It was just not comfortable for my wife. She loves the Trophy. With your leg length I was going to suggest lowered foot pegs, but they would end up not big enough to support your feet, you know what I mean. Great read and photos. Very happy you enjoyed my backyard. Nice work again Wom – thanks for all the details. Great ride and report. Love your work. Wom. Another great ride and report. I have been thinking about a replacement for my ageing tenere and after reading this I may have to consider the African Twin. Looking forward to seeing you in Renmark. Mmmm, I pick up a new Tenere today Jeff. I can’t be without one.